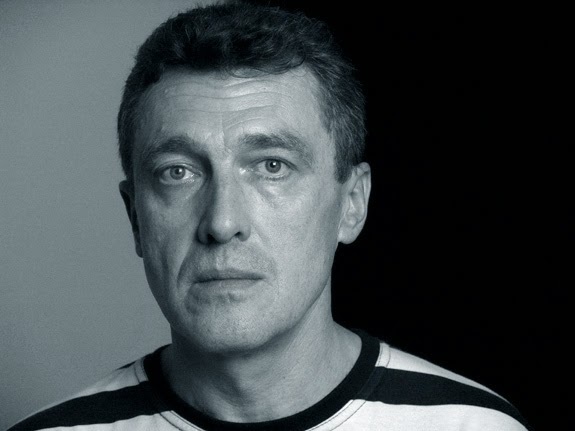 By the end of the 1980’s, he was one of the founders of an informal art group named "Тутэйшыя". He started to publish his works at the beginning of 1980’s . Hlobus is often referred to as a writer that "deflowered" the Belarusian literature when, as one of the first, he started to depict carnality and used obscene vocabulary. Probably, his most well-known work in the 1990’s was a collection of short stories "Demonocameron" (Дамавікамерон, 1994), in which the characters are mythological and folklore beings set in a contemporary context. In the last decade, he continued his active work and released several books, such as a collection of sketches "Notepads" (Сшыткі, 2003), "the self-portrait novel in a family interior" – "The House" (Дом, 2005), a collection of essays, sketches about Belarusian culture and bibliographic reminiscences – "Play.by" (2009), and many others. In 2013, his book "Fairy Tales about Adults" (Казкі пра дарослых, 2013) got into the long-list of the Giedroyc prize. V lete tohoto roku sa k situácii na Ukrajine vyjadril aj známy bieloruský spisovateľ a vydavateľ Adam Hlobus. Ktorý na svojom blogu ostro komentuje vystúpenie ruského politológa Alexanda Dugina, ktorý vyzval Vladimíra Putina, aby zabil Ukrajincov. Porovnáva Rusko s nacistickým nemeckom počas 2. druhej svetovej vojny. “Russian Nazist Dugin calls to kill the Ukrainians. He calls to kill people only because of their nationality. The German Nazizsts also called to kill the Gypsies without trials, they called to kill and killed people only because they were the Gypsies. Like the German Nazists, the Russian ones divide nations into useless and useful. This is barbarity,” Adam Hlobus writes. Являлся одним из основателей и участником неформального объединения молодых литераторов «Тутэйшыя» («Здешние», 1986—1990), которое в силу обстоятельств занималась не только литературой, но также выражало и активную социальную и политическую позицию. В частности, в октябре 1988 года объединение организовало, ставшую впоследствии традиционной, первую в Белоруссии акцию поминовения жертв советского режима под названием «Дзяды», с многотысячным шествием и митингом. Член Союза писателей СССР (1988), Союза белорусских писателей (с 1989 года). Na tejto stránke si môžete prečítať verše Adama Hlobusa v originálnom znení. Rozhovor s Adamom Hlobusom o používaní ruského a bieloruského jazyka v Bielorusku a tiež odpoveď na to ako prišiel autor vo svojich dielach na rôzne erotické výrazy, keďže ich ruština ani bieloruština okrem prebraných z cudzích jazykov nemajú. Okrem toho že je Adam Hlobus známy básnik a spisovateľ je známy aj vďaka svojim maľbám, v ktorých tiež možno vidno erotické motívy, ktoré sa objavujú aj v jeho prozaických dielach. Jeho prvá výstava obrazov prebehla v apríli 2009 v Minsku, v galérii "Подземка". V tomto rozhovore sa autor vyjadruje prečo začal písať rozprávky až v svojej neskoršej tvorbe. At the beginning of the 1980s, Adam Hlobus has already become a professional artist during his studies at the department of monumental and decorative art of the Belarusian State Theatre and Art Institute.